Christopher Columbus did NOT need directions and neither do we !! If we ask what is wrong with your food and you say nothing….we will act like nothing’s wrong. We know you are lying, but it is just not worth the hassle. If you ask a chef a question that you don’t want an answer to…expect an answer you don’t want to hear !! When we have somewhere to go for dinner, ANYTHING you wear is completely fine. Seriously…we will focus mostly on the food. You can ask us to either cook something or tell us how you want it done…NOT both. If you know best how to do it already, then DO IT YOURSELF !! Sweat pants are not a turn on, unless they are REALLY tight. However, pork belly is ALWAYS a turn on. Yes and no are perfectly acceptable answers to almost every question when we’re in the kitchen. We’re allowed to keep it SHORT. Crying in cooking is blackmail !! Anything we said to you while cooking 6 months ago DOES NOT COUNT in an argument. Any comment made after just two days is null and void !! Cooking is not a hobby and we will NEVER think of it that way. When we cook, it’s a no talk zone- just let it be. We truly do not care about what’s happening with your love life. As long as you’re happy, it’s all we need to hear. If something a chef said can be interpreted two different ways and one of those ways makes you sad or angry….we meant the OTHER one !! If you follow these simple and easy rules, everything will be OKAY in a chef-run country !! When voting today, make sure you keep #FabioForPresident in mind ; ) My recipes this week start the beginning of all my Thanksgiving dishes- I give you one a day until Thanksgiving arrives. So you have NO excuses for not having enough recipes to choose from : ) You can find all my recipes this week on Facebook, Twitter, and Pinterest. When you think of Halloween, 2 things come to mind…the color orange because of the pumpkin and lots of CANDY. My recipes this week are very orange-focused, like carrots and pumpkin and all of that. But, I thought I should give you the lowdown on the temperatures for making your very own candy since it is such an important part of this holiday. Maybe this will just be for yourself on Halloween or maybe you will go to the extreme and be the best neighbor on your block with your very own professionally made candy for trick or treaters. Either way, homemade candy is DELICIOUS !! You must first make sure that your candy thermometer is accurate or else your candy won’t turn out right !! Place your thermometer in boiling water- it should read as 212 degrees F or 100 degrees C. If the temperature is reading differently, just take the difference into account when you take the temperature while making your candy. Hope you enjoy making your own candy for Halloween this year !! Join in on the conversation about this week’s blog and recipes at @fabioviviani with hashtag #HalloweenByFabio. Make sure to tweet me photos when you make my dishes, I love seeing them !! You can find this week’s recipes on Facebook, @FabioViviani, and Pinterest. Wednesday, October 24, is United Nations Day !! Because of that, I give you my recipes that are inspired by other countries…some people don’t always like Italian food every day (although I don’t know why they wouldn’t…) !! We will explore the foods of India, America, Spain, Africa, Ireland, and the Caribbean…BOOM. Well there you go !! I impart all of this knowledge onto you so you can go on to do GREAT things with lamb !! Stay tuned for a few of my lamb recipes throughout the week. Go international this week !! Try new things !! 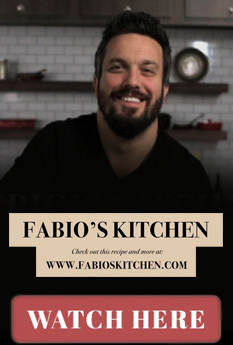 Let me know how the recipes turn out…you can tweet me photos anytime @fabioviviani. Check out this week’s dishes on Facebook, Twitter, and Pinterest. When you think classic Italian food…what do you think of ?? For many, they think PASTA !! And it’s National Pasta Day on Oct 17 !! It is the best comfort food to me, and it always takes me back to when I was a child and learned to cook from my mama and grandmother. We all know I very much love my pastas- whether it be gnocchi, penne, linguine..you name it, I probably LOVE it !! Farfalle (Bow Ties)- shape of a bow tie! Now we must cover how to COOK your pasta !! You must cook it perfectly to make it as good as possible ; ) Here are my tips for cooking the perfect pasta !! Use a LARGE pot with lots of water- more than you think you need! You want your pasta to have lots of room. For every 1/4 pound of pasta, use 1-1.5 quarts of water. After you bring water to FULL boil, add a splash of oil (not always necessary) & a few shakes of salt (I like this). Add your pasta & make sure it is COMPLETELY covered by boiling water- if it’s not at a full boil, it won’t be good ! After you add pasta, stir well so it doesn’t stick to bottom of pot…and then stir again after 2-3 mins. NEVER cover your pasta with a lid ! Start checking your pasta at the minimum time the package suggests- test it yourself ! If it is slightly firm but tender & not crunch/hard in the center, then you are GOOD TO GO. If it isn’t, check every minute until it’s ready !! Every second counts !! Once pasta is ready, remove it from the heat and drain in a colander. Shake the colander to get rid of all extra water, and you don’t need to rinse. Check my #PastaByFabio recipes for this week here: Facebook, Twitter, and Pinterest. This week it is my BIRTHDAY week…can you guess how old I’m turning ?? 25 you say ?? How did you know ?!? ; ) The big day is October 10 ! When I think of birthdays, I think of BIG parties and LOTS of food. I am Italian after all !! The dishes I give you this week are all my favorite foods…so that’s why I say you should make them for my birthday week !! …As always, don’t forget to check out my daily recipe cards on Facebook, Twitter, and Pinterest. I know many of you cannot wait for this week’s theme…because its ALL about desserts !!!! October is National Dessert Month — did you know that ?? We all know my LOVE of nutella, which means that I have a true love for chocolate and anything for my BIG sweet tooth ; ) Since this week we will be baking up a storm, I thought why not tell you all about an ingredient that is needed in almost all desserts ?? Have you guessed it yet ?? EGGS !! There are SO many different things about eggs that I thought I need to put them all together to teach you ! BROWN VS. WHITE: What is the difference between white and brown shell eggs you may ask ? Different kinds of hens can actually lay eggs in different colors, but the actual egg will have the same flavor. SOFT BOILED VS. HARD BOILED: Soft and hard boiled are cooked the same way but the cooking time is less in soft boiled (the yolk is runny instead of firm). EGG SIZE: Always use large eggs in recipes unless it says something different. There are MANY different size eggs like peewee, small, medium, large, extra large, jumbo, and MORE !! SLIGHTLY BEATEN VS. WELL BEATEN: Slightly beaten means that the eggs are mixed with just a fork until yolks & whites are blended together….well beaten eggs are beaten until the whites & eggs are light & frothy. EGG STORAGE: Best way to store eggs is to keep them in carton and refrigerate !! They should last for about 30 days but keep an eye out for the expiration date ! Keep hard boiled eggs refrigerated & they should last for about a week (smell will be bad if eggs are bad). Egg whites have a refrigerated shelf life of about ONLY 4 days. Egg yolks should be used within TWO days. Eggs should be at room temperature before adding them to other ingredients when you bake !! They beat up lighter and make everything BETTER when not too cold : ) It takes eggs about 90 minutes to get down to room temperature once you take them out of the refrigerator. If you are in a rush, you can try covering the eggs in a small bowl with warm water — they should be okay to use within around 5 minutes. SEPARATING AN EGG: This looks a lot easier than it actually is !! Instead of pouring the yolk back and forth between egg shell halves, you can buy an egg separator OR use a small kitchen funnel (crack the egg & pour it into the funnel…the egg white will come through the funnel while the yolk stays at the top). EGG WASH: Always you hear the term “egg wash”- but do you know what it is ?? It’s usually a whole egg beaten with a pinch of salt ! It’s used on pastries to make them SHINE or to moisten meats before putting them in flour/batter. FRESH VS. ROTTEN: I have an easy trick to tell if your eggs are fresh or rotten !! Put the egg in a bowl of water — a fresh egg will sink…so if it floats..it’s not fresh !! Using these egg tips and knowledge, I hope your baking of my #TreatYourself desserts this week will go SMOOTH and DELICIOUS !! Tweet me photos of your desserts when you make them @fabioviviani : ) As always, don’t forget to check out my dessert recipes on Facebook, Twitter, and Pinterest. Ahhh the fall season is upon us….I can just smell it in the air !! The leaves are changing colors and falling off trees. I always get that warm & fuzzy feeling inside when I think of this season because it makes me want to be with family and curl up by the fire !! I miss the time when LOG ON was a way to increase the heat in your fireplace and not something to do with technology!!!! AND I love winter clothing sooooo much….but since I’m in California, I don’t get to wear them so I really look forward for fall cause for the few months after I can wear something heavier!!! Sorry for rant…Anyway, this season marks the start of all the DELICIOUS holidays that are coming up !! Here is the cooking info for some tasty fall veggies that I know will make your tummy smile !! This info is all based on ONE pound of the vegetable—don’t forget !! Just a few helpful suggestions for when you cook these: When you steam, the time BEGINS when the water boils & you see steam. When you microwave, some veggies don’t need water, just the tiny drops that are still on after you’ve rinsed them ! Lastly, when you boil, cover the bottom of the pan with ½ – 1inch of water…if you have whole or dense veggies, use MORE WATER—and make sure the water is boiling BEFORE putting the vegetables in. How everybody like the comfort foods of last week ?? I hope you all enjoyed sharing memories with your family. Sauté- fry food very lightly until it is golden in just a SMALL amount of hot fat on your stovetop…don’t forget to turn it continuously !! Did that help ?? I hope so…. Join in on the twitter conversation about chicken this week with hashtag #ChickenDinner…stay tuned for my daily chicken recipes on Twitter & Pinterest ! !